Glycoproteins secreted or expressed on the cell surface at specific pathophysiological stages are well-recognized disease biomarkers and therapeutic targets. While mapping of specific glycan structures can be performed at the level of released glycans, site-specific glycosylation and identification of specific protein carriers can only be determined by analysis of glycopeptides. 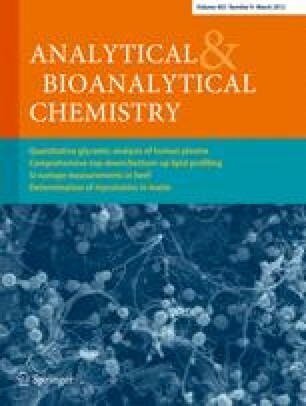 A key enabling step in mass spectrometry (MS)-based glycoproteomics is the ability to selectively or non-selectively enrich for the glycopeptides from a total pool of a digested proteome for MS analysis since the highly heterogeneous glycopeptides are usually present at low abundance and ionize poorly compared with non-glycosylated peptides. Among the most common approaches for non-destructive and non-glycan-selective glycopeptide enrichment are strategies based on various forms of hydrophilic interaction liquid chromatography (HILIC). We present here a variation of this method using amine-derivatized Fe3O4 nanoparticles, in concert with in situ peptide N-glycosidase F digestion for direct matrix-assisted laser desorption/ionization–mass spectrometry analysis of N-glycosylation sites and the released glycans. Conditions were also optimized for efficient elution of the enriched glycopeptides from the nanoparticles for on-line nanoflow liquid chromatography–MS/MS analysis. Successful applications to single glycoproteins as well as total proteomic mixtures derived from biological fluids established the unrivaled practical versatility of this method, with enrichment efficiency comparable to other HILIC-based methods. The online version of this article (doi: 10.1007/s00216-012-5724-1) contains supplementary material, which is available to authorized users. This work was supported by Taiwan NSC grants 94-3112-B-001-009-Y and 95-3112-B-001-014 to the NRPGM Core Facilities for Proteomics located at the Institute of Biological Chemistry, Academia Sinica. The LTQ-Orbitrap data were additionally acquired at the Academia Sinica common mass spectrometry facilities, also at the Institute of Biological Chemistry. We are grateful to Dr. Sin-Tak Chu (Institute of Biochemical Sciences, National Taiwan University) for providing the mouse uterine luminal fluid samples.